Their plane touched down at Idlewild Airport (oops, I kept saying that--it had just been renamed John F. Kennedy Airport in memory of the assassinated President) on 7 February 1964. I was there with Anne, along with the throngs of fans screaming the names of their four beloved moptops. Brian had arranged for the two of us to come along with the group on their two-week trip to the States. The trip would take us to New York, Washington D.C., and Miami. I had been given specific instructions from Brian on the location to go to and the code words we could use to get inside with them once they had landed. Anne and I were trying to carry on a conversation amid the roars of the teenage girls (who had obviously skipped school to be there!). It was chilly, but nobody seemed to care. Anne remarked, "All the hot air from those girls and the body heat is keeping the temperature tolerable!" I had a scarf over my head and sunglasses on to hide my appearance. Since nobody else looked like that, it almost made me more conspicuous. Since the Beatles had been gaining more and more popularity, I as afraid that I would be recognized. Nothing that was published about me in the Mirror had made it over to southern Illinois, but New York City might be a different story, so I played it safe. We spotted the jet, and as we tried to leave to meet Cyn (our designated person to stick with), we were almost either crushed against the railing or toppled over it, I couldn't figure out which was happening at that time, but I didn't care, I just wanted to get to the building safely. We managed to get away from the crowds and over to the building where Cyn was waiting for us, also in semi-disguise. Cyn had a pass for us to wear so that I was able to get into the press conference. We walked down an empty corridor and slipped in behind where they were going to be standing. I was amazed at the number of people in that room; it was truly overwhelming. We stood by Brian as the group walked into the press area. Paul spotted Anne and me as he walked past. He winked at us and brushed my arm with his hand. I took in a deep breath, recognizing his aftershave and remembering how nice it was to smell it. Anne elbowed me after he passed by and loudly whispered, "He's still got it!" As I watched the rest of them walk past, I laughed and dreamily replied, "Anne, you don't have to tell me that, he looks great. Actually, they all look great." She slapped my arm. "No silly, I don't mean it like that, I meant the bracelet, he's got it on!" I craned my neck to catch a glimpse. As if he had heard my thoughts, he happened to scratch his arm a little and pull his sleeve back just enough, and I saw that he was wearing the I.D. bracelet that I had given him. I was taken aback by that. I wasn't expecting him to not wear it, for that matter, but it just took me by surprise that he had it on. For all I knew, he had tossed it in a box when I left England in October and dug it back out when he knew he would see me. 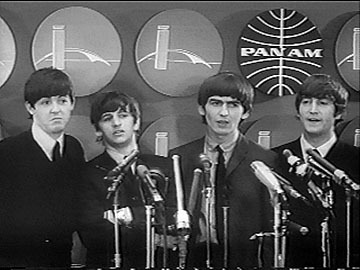 As the Beatles approached the mass of microphones, the room exploded into a frenzy of flash bulbs from press photographers, roars of shouted questions from reporters, and screams from girls who had somehow snuck into the press conference. The screamers were escorted out as the questions began. I was pretty impressed at the orderliness of the whole process; I had never been to a press conference before. Brian Soomerville, who I think was their press officer, was acting as master of ceremonies for the conference, which helped control the din. His first words were, "Gentlemen, gentlemen, gentlemen, will you please shut up!" Then it was the Beatles' turn to turn on the charm and win over everyone in America. The first question from the American press was "Do you believe in lunacy?" "Yeah," answered John, "it's healthy." Another reporter asked: "Would you please sing something?" "No!" the Beatles chorused. Everyone chuckled. "We need money first," John added. That brought roars of laughter from the crowd. Still another reporter asked: "Do you hope to get haircuts?" "No," George answered. "I got one yesterday." The reporters laughed, but Ringo added, "He's telling the truth!" More laughs. Still another reporter asked: "Do you hope to take anything home with you?" "Yeah," Paul quipped. "Rockefeller Center." Still another reporter asked: "What do you think of the people saying you're just British knock-offs of Elvis?" Ringo replied, "It's not true! It's not true!" as he wiggled his hips and curled his upper lip, which brought out still more laughter. While they answered more questions, Anne remarked, "I didn't realize just how charming these guys were! It's great to see all of them now instead of just one." She was beaming and staring at George, totally caught up in the throes of Beatlemania. I laughed. "Yeah, we can say that we knew them when!" The three of us laughed. Cyn added, "Hey, what about me? I've known John since art school, doesn't that count for something here?" 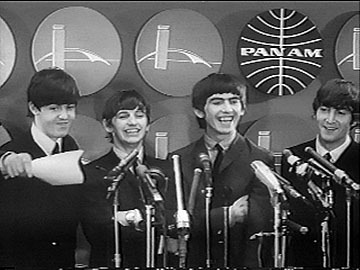 Our own laughs were drowned out by another roar of questions from reporters and a shower of flash bulbs as Brian Sommerville announced the conference was finished and the Beatles were escorted out of the room. Mal Evans (whom Brian Epstein had hired to help the Beatles sometime in 1962) came up to us and said, "Please follow me, ladies. We'll get you out of here safe enough." I had never been introduced to him before; he seemed like a very nice man, in contrast to his burly appearance. He led us to a room where limousines were lined up right outside. We watched as the group's luggage was piled into a separate car. Anne and I had arrived in New York a couple days before so we could do some sightseeing of our own, so our luggage was already at the hotel the entourage was staying at and we had gotten quite settled. Anne and I had met in Chicago and flew together. I got to see her engagement ring from Dave--it was just a decent-sized square-cut diamond solitaire, she had picked it out and she was not shy about showing it off! They were planning to get married in June of that year, and us getting together in February was a good excuse to have a last girls' night out before she got married! On the flight to New York, Anne showed me the dress she was getting made. She had found the bridesmaids' dresses in a magazine and wanted her dress to be similar. She had already called me at Christmas and asked me to be her maid of honor, so I was excited to finally see what I would be wearing! After all the luggage was packed into the one limo, we were all herded like cattle into the remaining limos and whisked off to the hotel. Cyn managed to get in the limo with her husband, and we ended up in the limo with Brian Epstein, Neil Aspinall, and a couple other people I didn't know. When Paul got into the car, I noticed that he had a portable radio practically glued to his ear; he was listening to the American radio stations. I had seen a bit of this type of crazy people-shuffling action before over in England, but Anne was inexperienced, I suppose! She was wide-eyed the whole day, just overwhelmed with everything that was going on. We made it to the hotel after what seemed like an eternity of girls chasing the limos, pounding on the windows and climbing on the hood when we got to a stoplight. There were three cars in the group and they were doing this to all the cars, even ours! Once the screaming throngs discovered that the Beatles weren't in our limo, they moved on to one of the other limos. Anne remarked that she felt like a caged animal in a zoo. I commented, "Me too, I kinda feel sorry for them 'cause I'll bet this is the way it is everywhere they go." The hotel had secured an entire floor for the Beatles, just for security and safety reasons. Brian had added us to their group so we were alright to stay on their floor. Our room was next to the one Paul and John were sharing, but not attached to it like theirs was to Ringo and George's room. We found out that we would be trapped in the hotel for quite a while that afternoon. Murray the K from WINS, a local radio station and the man responsible for getting the Beatles major radio airplay, was calling in to the hotel and talking to the guys. The phones in the suite were ringing off the hook it seemed. Brian had calls from London, and everyone else who called in was calling in to talk to the Beatles. Anne and I were so tired that we just walked into our room and plopped down on the beds, laying down with our arms spread. "Whew," Anne wearily said. "What a day!" I added, "You'll have to get used to it, we're stuck with these guys for two weeks! I can't wait for Miami, though. I've never even been to Florida!" "I still can't believe that your school let you have two weeks off in February," Anne said with a twinge of jealousy. I chuckled. "Somehow I managed. It helps when your mom is best friends with the principal!" I laughed more. "They have a substitute for the substitute!" For some reason my laughter was contagious. Anne added, "And what if she gets sick, they'll have a substitute for the substitute's substitute!" We were rolling around with laughter. Anne yelped, "Stop it! You're gonna make me pee!" That had never stopped me before! Of course, I usually had the same problem, but I had had the sense to go while we were still at the airport (escorted by a security guard, of course). I egged her on. "And if she gets sick...well, we might just have a long line of substitute's substitutes for the substitutes waiting to substitute! Imagine putting that on your resume!" Anne got up screaming with laughter and ran to the bathroom and slammed the door behind her. I could still hear her laughing from behind the door. There was a knock at the room door. I was advised by Brian to always ask for a password, you never knew who could sneak up into the wrong area of the hotel. I went with Brian's advice and asked, "What's the password?" "Aw, c'mon, Jill, you know it's me!" I opened the door for Paul to come in. He began, "You're not going to believe this one, we had three birds in our bathtub!" "Really?!" I commented, laughing. "You didn't take advantage, I hope," I teased. "Nah, they were politely escorted out. 'Ere, let me give you a hug." He hugged me tight. "It's great to see you, Jill. How have you been?" "I thought you didn't care, I haven't gotten a letter from you in about a month!" "Well, I called last week to make sure you were still coming, didn't I?" "Yeah, but I was getting ready to leave for work, we only talked for five minutes, silly!" He faked a dreamy voice. "Yes, luv, but even five short minutes hearing your voice is enough to quench my thirst for you!" He stretched out his arms toward me and smiled at me. I rolled my eyes. "Ah, stop it, goofball." I playfully pushed him away. I changed the subject with, "So, I um, notice you have the bracelet on." He pulled it out from the cuff of his shirtsleeve and casually said, "Oh, this old thing? Got it from some bird a while back, can't even remember her name, actually." I laughed. "C'mon, silly. Have you been wearing it, or did you just dig it out for this trip?" He gave me a strange look. "Jill, why would I do that? I haven't taken this off since you gave it to me--do you think it would be this scratched up if I'd kept it tucked away in a box? I'll never take this off, Jill. It's a great present from a great friend." I looked down at the floor, blushing a little. I managed to mutter, "Um, thanks." I looked back up at him and our eyes locked. As if on cue, Anne came out of the bathroom. "I thought I heard you out here!" She went up to Paul and received her hug from him. "Thanks for all this, this is great!" He brushed it off with, "Ah, it's no problem. I knew I had to see Jill again, and Anne, I had to find a way to thank you for all your hospitality when I visited last year. I hope you two have party clothes, we're going to the Peppermint Lounge tonight." We looked at him strangely. Two young Midwestern girls had little chance to hear about the happening spots in New York City. Paul caught that after a second. "Oh, you haven't heard of the Peppermint Lounge? It's supposedly where the Peppermint Twist got started, we figured it would be a swinging place to be, so we're heading out there tonight...unannounced, of course." The light bulbs above our heads lit up; we both smiled. Paul leaned into me and whispered, "I hope you wear that red dress of yours." I could feel my face getting hot, so I looked down at my feet and mumbled that I would wear it. I did bring that red dress, and I was planning on wearing it that night. Anne hadn't really brought anything appropriate, but Brian had solved that problem. He sent us out to Sak's Fifth Avenue with Neil and told us to get something nice, "But don't go overboard, ladies," he warned. The three of us went shopping while the group gave interviews to reporters. Even though I had the red dress, I still wanted to take a look. On the saleslady's suggestion that shift dresses were the thing to wear to the Peppermint Lounge, we searched the racks. I found an emerald green shift dress with a basic neckline. I thought it looked pretty good; it fit like a glove, plus it was on sale. I know that Paul had mentioned the red dress, but I couldn't resist! Anne was trying on everything in the store and finally let us see her in a lemon yellow shantung shift dress that was cut a little tighter than mine. I loved the style on her (she was taller and could easily pull it off), but when I tried on the same dress, the style looked dumpy on me, not to mention that lemon yellow was not my color at all! I warned her that that tight of a dress might not be conducive to dancing, and suggested that she try it out. "Right here? In the store?" she asked. I replied, "Yeah, seriously! You should just test it to make sure you won't rip a seam tonight! You can't go to the home of the Peppermint Twist and not Twist!" Neil was chuckling; he was sitting in a chair near the women's dressing rooms. Anne rolled her eyes, and grudgingly began making dance-like moves. Surprisingly, she didn't draw too many looks from the shoppers or the employees. It turned out that she wasn't going to be able to twist the night away in that dress. After I gave her a quick "I told you so," she was off searching for something else. She found a royal blue shift dress that fit a little looser and was more conducive to dancing. After we paid for the dresses, we went to the footwear department and found heels that matched our dresses, and bought those as well. Neil volunteered to carry our packages; how could we refuse a request from such a gentleman? When we got back to the hotel, we had to go through the proper security clearances before we could go to the room. There was a guard at the elevator on the 12th floor (where we were staying) that made sure we were kosher before he let us off. We got back into the room and hung our dresses up on the rack in the room. Brian knocked on our door, asking what we wanted from room service for dinner. "Cheeseburgers!" we said at the same time. Guess we were getting back in synch again! We all ate our dinner in a common area in the suite that the four guys were sharing. Anne and I excused ourselves to change for our excursion to the Peppermint Lounge. Before we changed, I closed the drapes, and heard loud screams from below. They died down after a minute, and I re-opened the drapes to peek outside. 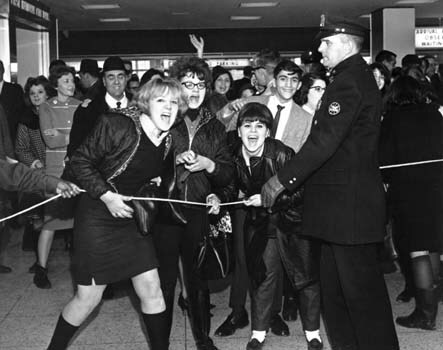 I was greeted with even more screams from the young, faithful, and stupid--a crowd of girls had been standing outside (remember, it was February in New York) since the Beatles arrived at the hotel, and apparently someone had tipped them off that they were on the 12th floor. Anne and I decided to play some silly games while we were changing and open and close the drapes a few times. Like Pavlov's Dog, every time we opened the drapes, the crowd erupted in screams, shaking their handmade "Welcome to America Beatles!" signs up towards the heavens of the 12th floor. At least it made them stop singing their off-key "We Love You Beatles" to the tune of "We Love You Conrad" from Bye Bye Birdie. John came over to see what the hubbub was; luckily we were dressed by that time! "I heard mischievous giggling coming from this general area!" We told him what we were doing, and John being a jokester, he got quite a laugh out of it. After he played the drape game a couple times, he looked us up and down and remarked, "Man, you American birds sure know how to dress! You two are knockouts!" We both blushed at that, being complimented by a man who was probably one of the most famous rock stars in the world. Even though I was familiar with John in person, Anne was all new to this. We finished getting ready and went into the common area of the suite. Paul looked at me, then looked back at Brian and commented on how much he liked his brown suit. Brian looked puzzled and replied, "Paul, my suit is navy, you'd better get your eyes checked when we return to England." Paul answered, "Well, Brian, I thought my eyes were alright, at least they were this morning...seems I've gotten a spell of red-green color blindness. Hmm..." He got up out of the chair and walked over to Anne and me. "Hmm...well, now this is blue, right?" he asked Anne, indicating her dress. "Yes," Anne replied, with a quizzical look on her face. He shifted his look to me. "Now this, last time I saw a dress on you, Jill, I could have sworn it was red. And now this one is green, right?" "Yes," I said as I was stifling my laughter. I knew exactly where he was going with this, so I decided to not beat around the bush. "Paul, do you want me to go change? Is that what this is about?" "No, you don't need to change, I guess I just need my eyes checked. It's just red-green color blindness I suppose...then again, I don't remember the skirt being like that on that dress..." He scratched his five o'clock shadow on his chin as he looked at me. "I'll be right back," I grumbled. Paul followed me into my room. "What, you wanna get your jollies by watching me change?" I asked impatiently as I laid my coat on the bed. He pouted and said, "No, I just wanted to know why you didn't wear the red dress, even after I asked you to." I could tell he looked a little hurt. "I honestly was planning on wearing it...really. But I went out with Anne and Neil, and Anne was trying stuff on, and it's just no fun trying on stuff by yourself--it's something we girls do--anyway, I tried this dress on, and I thought it was fab, so I got it...you're not mad at me for something this stupid, are you?" "No, of course not! I can't believe you would suggest something so absurd!" He noticed the red dress hanging on the rack, picked it up and came right up to me and said, "Jill, I would greatly appreciate it if you would wear this lovely garment this evening. Not that you don't look good now, but in this dress you look great, stunning, whatever you want to call it...please?" He was looking at me with those puppy-dog hazel eyes and a sly smile. How could a girl resist? I surrendered. "Alright, Paul, I'll change. Would you give me a minute?" "Sure, I need to go to the loo anyway." He headed into the bathroom as I turned on the radio and slipped into the red dress. I had on a gold chain with the green dress, but since I had changed anyway, I put on my silver necklace with the rose quartz and diamond charm that Paul had given to me the June before. I was looking at myself in the full-length mirror. Yeah...I did look good in that dress! Paul emerged from the bathroom and came over to me at the mirror. He was standing behind me, looking in the mirror and smiling at me. I saw him look down at the necklace and his smile got wider. He put his arms around my waist and said, "Now that's the Jill Dearborn I remember!" Before that moment, I felt sure that I was over him...but feeling his arms around me, smelling his aftershave, feeling his breath on my bare neck...I almost felt dizzy. I closed my eyes, hoping it would help squash the impure thoughts I was having. I looked down at the floor and opened my eyes back up. I looked in the mirror and our eyes locked. I felt something, but at the time I wasn't sure what it was. I wasn't floating among the clouds; then again, my heart didn't sink into my feet like a hundred-pound weight. But I was certainly feeling something...and from the look on his face I could tell that he was feeling something, too. Without saying a word, he turned me around to face him and gently kissed me on the lips. I put my hands on his forearms as we kissed, not wanting to fully hug him for fear that I might not ever want to let go. The radio station had been playing all Beatles songs all day, and the one that started at that moment was "'Til There Was You." He took my arms and began dancing with me as he hummed the song. I could have stayed there forever, still knowing that it would be dangerous for me to do so. No matter how much I knew that we would not work out under the present circumstances, in the present time it felt right...yet I knew I had to stop it. I tried to lean away from him, but he pulled me closer to him and whispered, "You're not going anywhere, I've let you go twice already and I don't think I could bear losing you a third time." Before I could say a word, he leaned in to kiss me and I didn't pull away. John started in on Paul. "So what the hell you think you were doing in here? You said yourself that you wouldn't let yourself get involved with her again!" Paul shushed him and continued in a low voice. "I know, I know, but I just can't help it! I know that we should be just friends now, but there's just something there...something that's like electricity, some sort of connection between us, and I swear John, it's not just below the waist. She's different from the others." "Like I haven't heard that one before," John said sarcastically. "But she is, John, seriously!" Paul pleaded. "Somehow I doubt that, Macca." "Why don't you believe me, John? You know I haven't been able to shut up about seeing her again, what more proof do you need?" John's whispering grew louder. "You wanna know why I don't believe you? Because you think this with every girl you're with for longer than the usual fifteen minutes! You've been bouncing from bird to bird since she left! Hell, you were doing that before she left!" "If she heard you, John, I'll smack you one!" "Who cares if she heard? She would have found out soon enough if you had stayed with her," John snapped. By this time, it was apparent that they didn't care if I had heard; they kept on at a very loud and angry whisper. "Well, maybe I should tell Cyn what goes on during some of our late night parties on tour." "Leave Cyn out of this, this has nothing to do with her." "Alright then, I'll leave her out of this, but you're certainly one to call me on the carpet for cheating on a woman!" I heard John sigh. "Look, I'm sorry man, I don't mean to get mad...I just hate to see you break her heart. She's a sweet girl, Paul, don't mess with her. She deserves better." I leaned against the bathroom door, listening to this conversation in disbelief. It had taken a lot of time, but I was mostly over Paul. I had not dated anyone since Paul, and sure I had a rough time of it, but I just succumbed to the fact that we were of two different worlds. Then again, I hadn't known that he had cheated on me until that moment. I could have gone my whole life without knowing that lovely tidbit of information...like they say, ignorance is bliss. This opened up a whole new can of worms. I walked out of the bathroom and both of them fell silent. We stood there awkwardly for a bit, then Paul said, "Well, we're off then, eh, luv?" He forced a smile and offered me his arm. I avoided looking him in the eyes, grabbed my coat off the bed and walked on past him and out the door. I didn't want to cry, I just wanted to hit something. I had an afterthought as we were walking down the hall; I should have changed back to the green dress, just to spite Paul. Copyright © 1999-2006, Winona Patterson.